In 2014, PM Modi said he was a ‘chai wala’ and now he says he is a ‘chowkidar.’ But the nation today needs a zimmedar (responsible) and Imandar (loyal) leader, stated KTR during the election campaign in Malkjaigiri constituency. 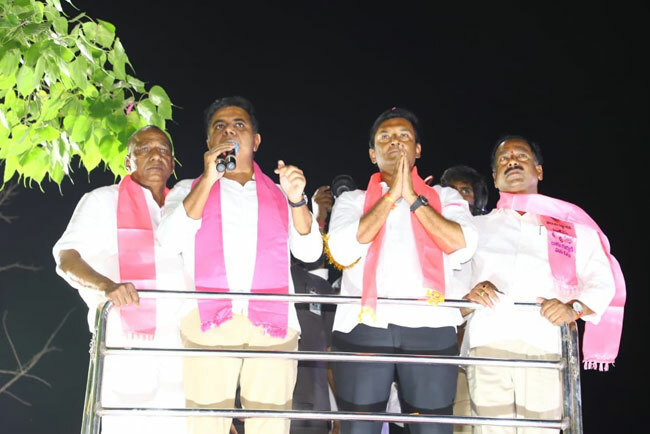 TRS Working President KTR participated in multiple roadshows across Malkajgiri constituency along with TRS MP candidate MLR Rajasekhar Reddy. 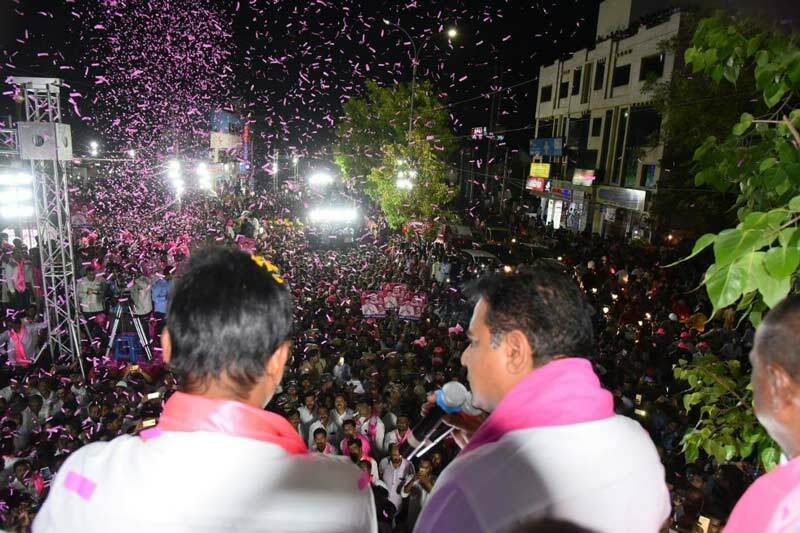 During the roadshows, KTR appealed to the people to think wisely and choose their leader. Addressing the gathering, KTR said, “The entire country is talking about the development of Telangana.” He stated that many other states are emulating welfare schemes of Telangana. KTR asserted that PM Narendra Modi never responded to the requests of the State government. He accused the Centre of ignoring recommendations of NITI Aayog to sanction Rs. 24,000 crore for Mission Bhagiratha. PM Modi has completely failed in fulfilling the aspiration of the people of Telangana. KTR fired at the center for always ignoring Telangana and said that the leaders at the center always develop their native states. “To develop Telangana, we need more of TRS MPs in Delhi who can strongly fight for the interests of the state,” he said. Taking a dig at Congress and BJP, KTR stated that both the parties are retained to only North India and are no longer national parties. “If you vote for Congress, Rahul Gandhi will be benefitted and if you vote for BJP, PM Narendra Modi will be benefitted. But if you vote for TRS, people of Telangana will receive the benefits,” said TRS party Working President KTR. TRS government has resolved water problem in Quthbullapur, Uppal, and Malkajgiri areas, KTR stated. As an election promise, KTR mentioned that he would work towards setting up an IT park in Malkajgiri region. KTR said that the victory in the Lok Sabha elections will make TRS the deciding factor in national politics.